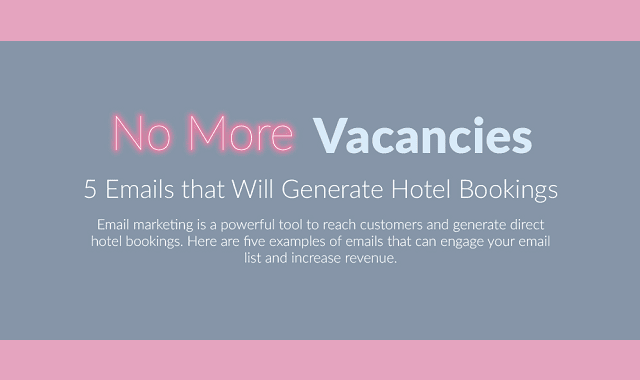 5 Emails That Will Generate Hotel Bookings #Infographic ~ Visualistan '+g+"
You know the area surrounding your hotel better than your visiting customers do. That is why they rely on you to let them know what interesting events or attractions are nearby. As a hotel owner, you can turn this knowledge into increased revenues that help you maintain the profitability of your business. Repeat customers are essential to your success. Encouraging your customers to come back routinely guarantees a source of steady income. An email marketing campaign is one of the most effective ways to do this. Studies show that email strategies work, and one of the best techniques is to provide free information that your customers are actually interested in. Draft a short letter describing all of the exciting things to do in your area. These can be special events or unique attractions. Send this email out to all of your guests that have registered with your hotel. This email reminds them of their stay, and positively associates your business with pleasant vacation memories. Your customers are more likely to keep your hotel in mind when they are making plans in the future. This is just one of several effective techniques for a successful email marketing campaign. To find out more ways you can use your email strategies to increase revenue, check out the infographic below.